Temperature is dropping, time to wrap myself up in a cozy cocoon sweater. I have a slight obsession with knits, not nearly as severe as my shoes obsession of course! I have lots of sweaters and cardigans, in all colors and patterns. They are practical, they are comfy, they are perfect for layering or to be worn alone. The point is you can never have enough sweaters! I complemented the bright mustard color of this cocoon sweater with a plum floppy hat and this gorgeous plum woven clutch. Since everything is solid, I wanted to add some pattern and funk to this outfit with cheetah skinnies and beaded feather necklace. Finally, gave the whole look a little more edge with Sam Edelman Zoe booties. 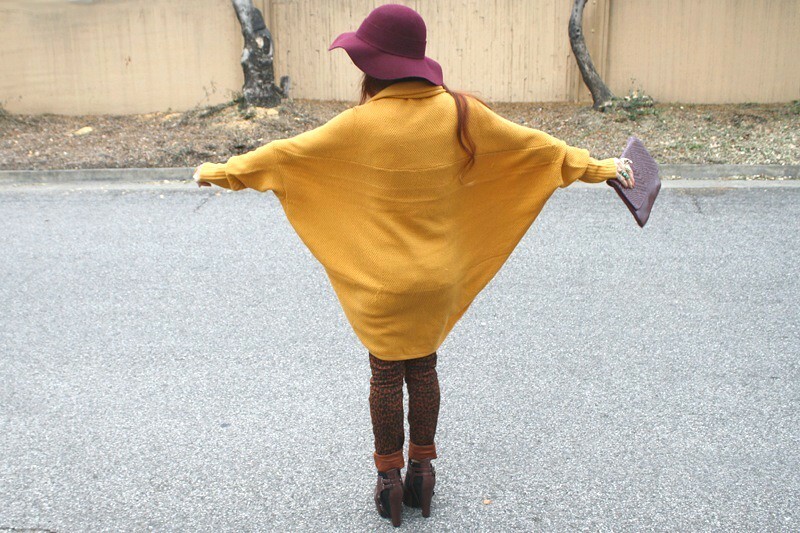 Mustard cocoon sweater by Timing from my work Sway. Cream sheer chiffon top by Chocolate from my work Sway. Cheetah skinny jeans from F21. Plum buckled floppy hat from F21. Plum woven clutch from my work Sway. Sam Edelman Zoe booties from Karmaloop. 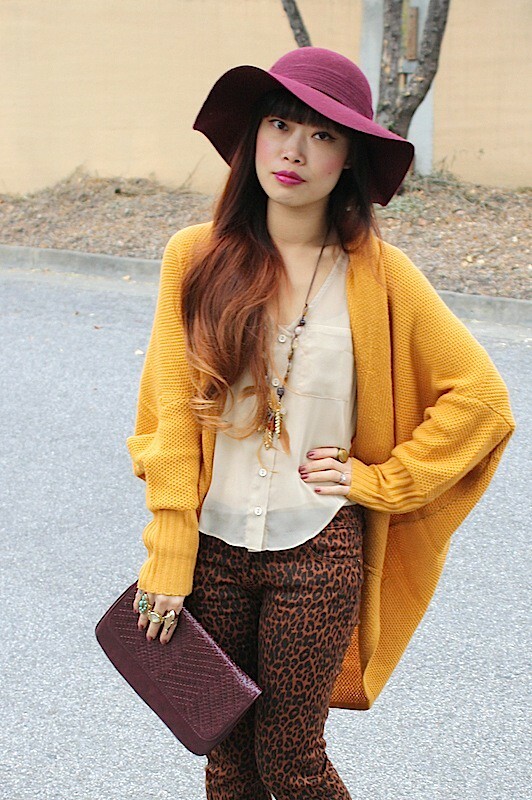 i love the mustard sweater! I Looooove those booties! I wanted to get them from Nasty Gal! Cute post! Beautiful shoes wow! that sweater looks oh so comfy! i love that you played with all of the earthy mustard colors. I love your blog and your style so very much so I am following and adding you to my blogroll this minute, yeahhhhhhhhhhhhhhh. I'm a leopard print lover so I must say: love your pants :) and shoes of course!! Hello, happy day, fantastic outfit..
your cardigan and clutch love it..